A lenticular cloud formation over the Lemaire Channel on the Antarctic Peninsula in Antarctica. The Antarctic Peninsula had been warming since at least the 1950s, when the first weather stations were set up. But a shift in prevailing winds has resulted in it cooling since 1998 — although this region is still warmer than it was when observations began. “What we are seeing is natural climatic variability overriding global warming,” says John Turner at the British Antarctic Survey (BAS), who led the study. 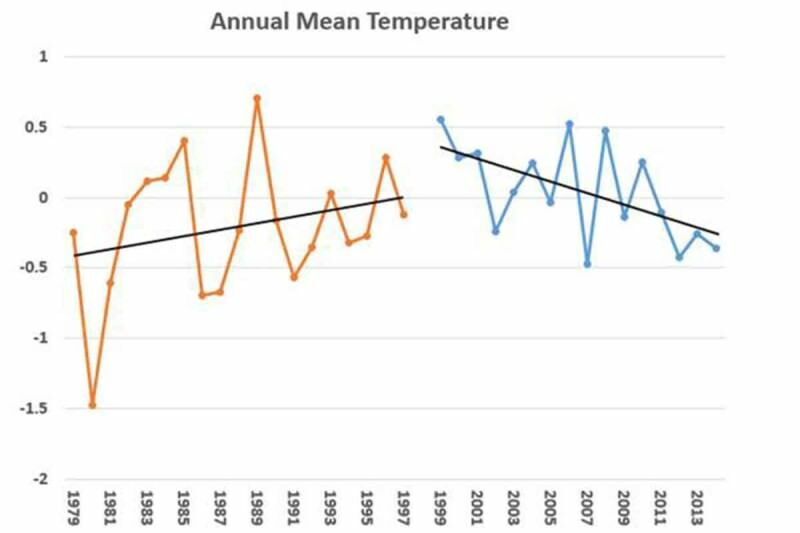 The peninsula has cooled by roughly 0.5 °C per decade, which is similar to the rate at which it warmed in the preceding five decades (see graph below). This cooling will be temporary. Even if the winds don’t change again soon, global warming will overwhelm their effect in the coming decades. Nor does this slight cooling of the air above one part of Antarctica mean we can worry less about the main threat from the continent: sea level rise. That’s because the accelerating loss of ice from Antarctica is driven almost entirely by the warming seas around the continent. The unstable West Antarctic ice sheet has already passed the point of no return, meaning there’s no way to stop sea level rising at least 5 metres over the coming centuries. And if we don’t do more to limit warming soon, we’ll be committed to a rise of about 20 metres. Overall, global surface temperatures have risen by more than 1 °C since preindustrial times, but there are big variations from place to place. The Arctic has warmed by several degrees, as its heat-reflecting sea ice shrinks and exposes ever more heat-absorbing open water. Antarctica, by contrast, has barely warmed at all. The warming seas around its edges are nibbling away at ice shelves and glaciers, but have not – yet – penetrated its vast interior. What’s more, the winds that circle the South Pole act as a shield, keeping out warmer air from higher latitudes. These winds have grown stronger, partly because of the hole in the ozone layer. The exception to this was the Antarctic Peninsula, which extends far out from the rest of the continent. Up until 1998, the six weather stations on the northern tip of the peninsula – about 1 per cent of Antarctica – had been showing a clear warming trend, driven by warm westerly winds. Winter temperatures increased by 6 °C at one station, which led to the peninsula being described as the fastest-warming place on Earth. That warming was linked to a decline in the Adélie penguin population and the disintegration of a large portion of the Larsen B ice shelf, which had existed for millennia. But over the past two decades, cold easterly winds have increased in strength, resulting in a cooling trend. There’s been little change in the rest of Antarctica, says Turner. What’s most surprising is that Turner’s team conclude that the previous warming seen in the Antarctic Peninsula cannot be clearly attributed to global warming. Data from ice cores suggest it is still – just – within the range of natural variability seen over the past 1000 years. This aspect of the study is likely to be seized upon by climate deniers. To be clear, Turner’s team isn’t saying that the net warming in the peninsula isn’t due to climate change, just that several more decades of warming will be necessary before we can say so for sure. Climate models are predicting that the region will warm by several degrees this century. And with 2016 set to be the warmest year by far since records began, the evidence of global warming has never been clearer. The world is approaching the 1.5 °C above preindustrial limit agreed at the UN climate summit in Paris last December alarmingly fast. “We have not got to that initial Paris number, but it’s fair to say we are dancing with the lower targets,” Gavin Schmidt at NASA’s Goddard Institute of Space Studies said Tuesday as he revealed that this June was the hottest ever recorded.